When you arrive at the airport for a flight, you probably have your routine down. To get to your gate with time to spare, you should be arriving two to three hours before your flight (depending on what airport you are departing from, whether you are checking bags, and whether your flight is domestic or international). Maybe you check in at a kiosk and self-tag your bag to save a bit of time so you can grab a Starbucks once you clear security. During that time, Alaska employees are working hard to prepare your flight. As the No. 1 on-time airline in North America, Alaska Airlines has it down to something of a science. So what is going on behind the scenes to make sure your flight gets off the ground safely and on time? By the time you get to your gate, you may have already missed a lot of the magic, and a lot of the action happens out of view. Customer service agents are staffed in the lobby and are ready to assist you, typically starting two to three hours before your flight. As your first in-person point of contact, they’re eager to answer questions and help you get your needs met, whatever they may be, as quickly as possible. Some lines are designated for those who just need to drop off their pre-tagged baggage—an agent will check your ID, scan your bag, and if all looks good, you’re on your way to security checkpoint in no time. Other lines are designated for those with questions or more check-in needs, like those traveling internationally or with pets and oversized baggage. 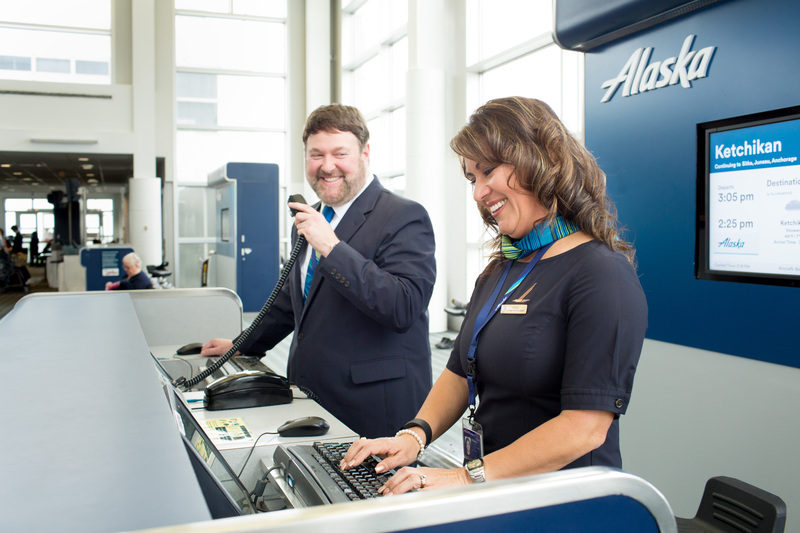 Alaska knows there’s no one-size-fits-all approach, so this part of the process is designed to provide the speed, service and convenience you’re looking for. Make sure you arrive about two hours early for a domestic flight (three for an international flight). Because there is so much to be done before your flight takes off, and because there are thousands of other travelers relying on on-time flights, the check-in and bag drop cut-off is typically 40 minutes before departure, without exception, with earlier cut-off times in certain locations and for international flights. You should always check the specific recommendations and cut-off times for the airport you will be departing from for guidance. Alaska holds firm to these listed check-in and bag drop cut-off times to ensure that your flight will be ready to leave on time. Agents can take your checked baggage as early as four hours before your flight. Checked bags get screened by TSA after they’re placed onto the belt. All oversized bags are hand-searched by a TSA agent behind closed doors after you check it. If you have large or unusual items (such as instruments, skis and snowboards, or even the occasional oversized box of cheese), it’s best to give yourself a little extra time at the airport. While you’re checking bags, Alaska’s employees are also thinking about preparing your aircraft. Long before the plane lands and taxis to the gate, aircraft technicians know about any maintenance needs like oil servicing or pilot write-ups.Technicians are waiting at the gate when the aircraft arrives, ready to jump into action. Behind closed doors, there is a huge maze of belts and scanners that will carry baggage to the correct gate. 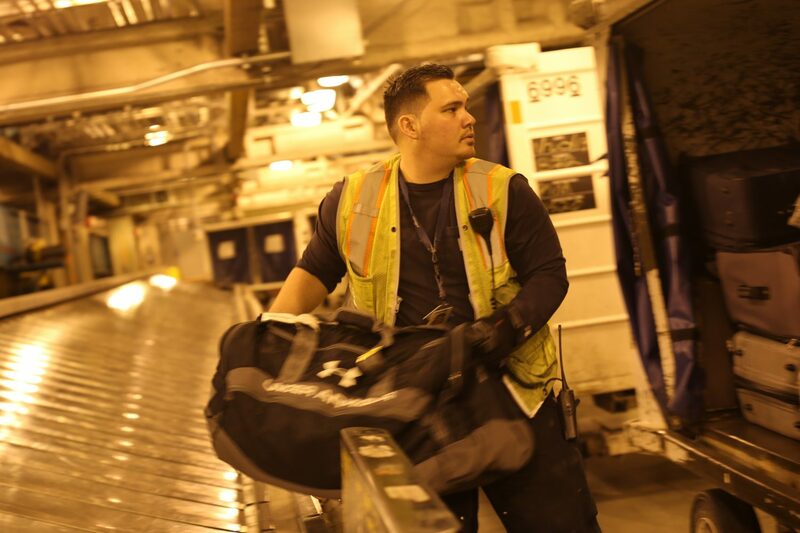 From the point where you drop your bag to the aircraft, the average bag will travel over two miles of conveyer belt. Bags are on the move from the time you drop yours off at D-40 (40 minutes prior to departure) up until ten minutes before their flight is scheduled to depart. This is also when the “load plan” is finalized for your flight. Agents at the gate call into the operations office to learn about any special instructions about where passengers can be seated on the plane or about baggage and cargo. Every flight’s load plan takes into account weight, balance, and fuel efficiency, among other factors. For example, if a flight is half empty, baggage handlers will strategically load bags to balance out the gaps in where passengers are sitting. If you’ve ever been asked to stay in your assigned seat and been confused because there’s a nice empty bank of seats five rows ahead of you, this is why. Loads are balanced down to every last seat for your safety and for the efficiency of the flight. Once the load plan is confirmed, agents on the ground begin loading baggage into the cargo hold. Inside the airport, agents update the monitors at the gate to display information about your flight and destination. They also monitor the temperature of the aircraft to ensure that it is comfortable for boarding. Agents at the gate begin checking in with unaccompanied minors and attending to any special accommodations. These agents also process seat changes, upgrades, and list any standby passengers if there is room on the aircraft. If wheelchair support is needed, they’ll have someone sent to the gate to assist. During this time, a crew cleans and restocks the aircraft with seatback materials like safety cards and magazines as well as supplies in the lavatories, including soap, toilet paper, and paper towels. This is when the flight crew arrives at the gate—the captain, first officer, and 3-4 flight attendants, depending on the aircraft type. One of the agents at the gate will take attendance and check the crew in. Catering will stock the plane with the meals, snacks and beverages for the flight. The pilots will perform a pre-flight inspection of the aircraft, looking for any abnormalities or maintenance needs that need to be discussed with an aircraft technician.The technician may perform a walk-around of the entire aircraft. While this is done, the crew board the aircraft. In winter weather, deicing will take place after the guest boarding door has closed. The captain will have already begun to verify the route of the flight, the weather, fuel required, and any other items that may be a factor for that route. The first officer is simultaneously loading this information into the flight management system. Then, the captain and first officer run through the checklist together ensuring that each item has been accomplished. Flight attendants, once onboard the aircraft, start their preflight safety checks including reviewing emergency procedures, verifying that all of the safety equipment (like flashlights, oxygen bottles, and first aid kits) are in working order, among other tasks. Once the crew is through their checklists, it’s time to board the aircraft. Pre-boarding begins for guests with small children or those needing additional assistance, then active duty military, First Class, Premium Class and Mileage Plan elite members. The main cabin boards next, back to front. About 13-15 minutes before your flight, agents at the gate will make last boarding call announcements. All guests must be onboard and in their seats at this point to ensure an on-time departure. Here’s a little known fact—if every guest is on the plane and in their seat, flights can leave up to 30 minutes early (pending completion of the safety checklist). Flight attendants complete the FAA-required check in with guests seated in the exit rows to make sure they are able to fulfill the needed responsibilities in the event of an emergency evacuation. When they get a verbal confirmation from each person, the process of closing the flight can begin. To close the flight, agents print off the final manifest of the guests on the flight and deliver it on board to one of the flight attendants. Your flight cannot depart without this paperwork on the aircraft. Once the manifest is on board, agents and crew close the jetway door. At this point, it will not be reopened even if the aircraft is still parked at the gate, so make sure you are at the gate well before this time. 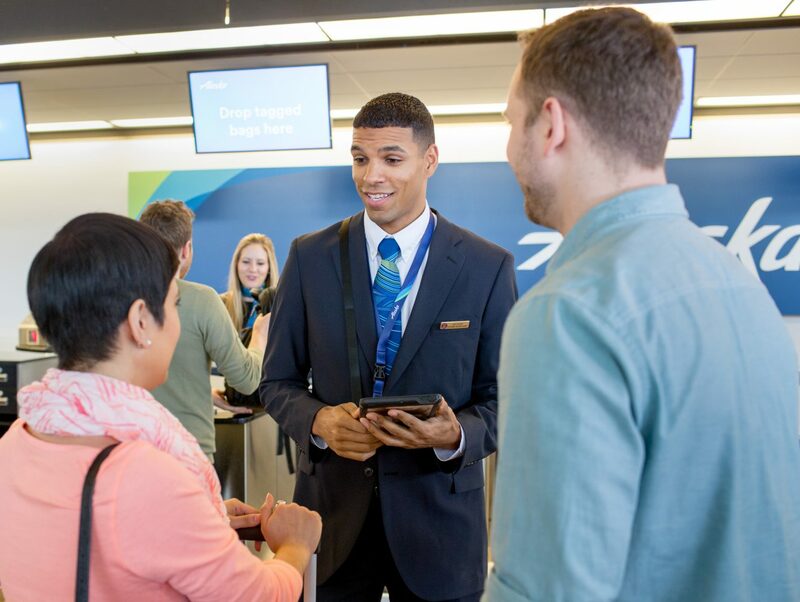 The agent at your gate will call into the operations office with the final numbers—a requirement before take-off. Then the plane door can close. Onboard, your flight attendants will demonstrate the FAA-required aircraft safety procedures. When cleared for take-off, you are on your way! 10 comments on "What’s happening behind the scenes before your flight"
I want to thank you Alaska Airlines for your service. I flew quit a bit this last year and never had a problem. Want to thank you for extending service to Raleigh,N.C. my son and his wife live there now and makes it more convenient for us to visit. Also your agents make it very easy for those of us with special luggage to have checked thru. Looking forward to my next flight. Forgot to mention that the ground crew goes onboard for that tiny space of time between deboarding and reboarding and cleans the inside of the aircraft, crosses all the seat belts, empties seat back pockets and picks up leftover trash before the next group of passengers board. A lot going on in a short time. To ensure efficiency and reduce delay during TSA checks and checks by Customs Border Protection Officers, the passenger details information could be shared in advance with them. If any concerns are identified with a specific passenger than he/she should be contacted in advance and give the opportunity to provide additional information to comply. In most cases passengers with concerns come to know about any issues at the time of check-in or during going through immigration. This process significantly delays the checks for other passengers. You guys do awesome! My preferred way to fly. Thanks for the behind the scenes look. Denise do you realize how many flights are departing an airport each hour? Each of those passengers on those flights need to check their bags and go thru the TSA check point, gates where your flight is leaving can be at a Tram ride or long walk away from where you check in. It is not all about just 1 flight departing the airport!!! Excellent operation congrats Alaska you’re the best. Really interesting! Love the photos! Who is that handsome agent?